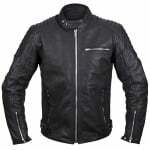 This is a lovely classic looking jacket Excellent value for the money, really good quality thick leather Very comfortable I would recommend getting a size bigger as it is a snug fit. As always a excellent service from SPORTSBIKESHOP. Really nice jacket, especially for the price. Good quality leather that feels durable. Looks good too. Very happy. I bought this jacket to wear as casual, all the protection pads are removable. Also comes with a removable inside thermal waist coat. I'm 5ft 9, 42 chest and large fits me great. Nice chunky zips. Leather a little stiff at first but softens the more your wear it. Quality is high. Fast delivery as always too. Many thanks. I was looking for a motorbike jacket to wear for fashion. Amazing quality leather for the price, nice padding and nice to look at. I wanted a tighter fitting leather jacket (as it was more for fashion). So I ordered a size down from what I would with a textile jacket, which was ideal. Nice thermal lining as well. Only annoying thing is the buckles to adjust the waist brush on the arm when walking. Have bought Weise products before and found them to be of good quality and reasonably priced. This is no different. Armour is well positioned and secure, zips feel zippy. Bought a Weise jacket 30 or so years ago, which my son now uses and it is still in great shape. So looking for a new leather myself. I thought that I would give this a go, half expecting to have to send it back as it was so cheap, but no, this is an excellent jacket. Great quality leather and zips, good fit. I will probably just replace the back protector as the one supplied is a bit basic, but no complaints given the price. Thanks Weise. Another top quality jacket from Weise. Lots of well engineered details, pockets, liners etc. At this price it is a steal! Ive had a Weise jacket for over 10 years and it has never failed me. This latest purchase looks to be the same. I am a 46 inch chest, 6 foot and 15 stone and find this jacket a comfortable but snug fit in an XL size. Good quality leather and robust looking zips. Great jacket made from good leather. Smells totally bovine! Padding and armour feels excellent. The fitting is comfortable...but take a step up in size. Arms are slightly long but its minor. The zips are great and have long pull things that make zipping up and down dream. Buy it...it's a bargain! Got this jacket not for the Bike just for casual. I have a Thruxton but Weise don't do it in black. This is a great alternative. Really looks good. I'm a size 42 but went 44 fits great. All good form Weise and Sports Bike Shop. Happy Days. I found this jacket comfortable and of high quality for the price. I ordered a size up after reading other reviews and it fits perfect! Lightweight, perfect fit, comfortable, great looking jacket. Go one size up, otherwise it will be too snug. Nice thermal liner for colder days and several pockets for small items including a mobile phone pocket. Quick delivery.